Aidan O'Brien is as optimistic as he can be with market leader Rhododendron ahead of the Qipco 1000 Guineas at Newmarket on Sunday. The Ballydoyle trainer knows what type of filly is needed to have a victory march down the Rowley Mile, having saddled the winner three times and believes Rhododendron fits the bill. The daughter of Galileo saved her best performance as a two-year-old until last when picking up the Fillies' Mile in taking fashion from stablemate Hydrangea over the course and distance. 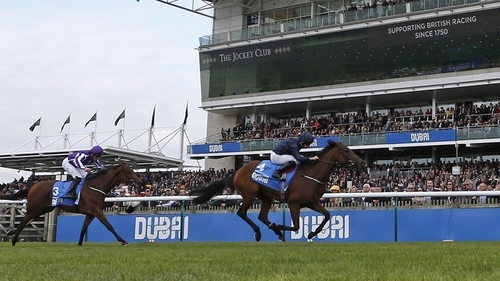 O'Brien reports Rhododendron to done everything right in the build-up to the Classic. "Rhododendron is a very nice filly and she won the Fillies' Mile well last year," he said. "She got a mile well as a two-year-old last year so you would imagine she'll get a good bit further this year. "She's in good form, she's a clear-winded, good-minded filly and we think she's straightforward enough to ride. "We've been happy with her since last year and physically she's done very well." Hydrangea and Winter, first and second in the 1,000 Guineas Trial at Leopardstown, give O'Brien a formidable hand while his son Joseph has a live contender in Intricately, who beat Rhododendron and Hydrangea in the Moyglare Stud Stakes. "She ran well in Leopardstown in what was a competitive race. It was her first run of the year and hopefully she'll come on from it," said her trainer. "It's nice to have a runner. You can't go into a race like the 1000 Guineas expecting to win. "It would be unbelievable if it did happen, but we'll see what happens." The home team is headed by Daban, who was a ready winner of the Nell Gwyn Stakes over seven furlongs at Newmarket last month on only her second career start. Trainer John Gosden feels that run will have done her the world of good. "She handled Newmarket well and she has come out of her trial very well. I'm very happy with her. There is a lot more mentally to come and she will come on for that race," he said. "It looks like an exciting race and we've got all the respect in the world for Rhododendron, obviously, as she comes with the solid form." Roger Charlton is keen on the chances of Fair Eva and consciously made the decision not to give her a prep race in 2017. Fair Eva is one of two daughters of the mighty Frankel bidding for Classic honours. The other is the Richard Fahey-trained Queen Kindly, who had Fair Eva back in third place when winning the Lowther Stakes at York in August. She was fifth in the Fred Darling on her reappearance and the big question is whether she will stay. Owen Burrows is keen on the prospects of Talaayeb, who goes for Classic glory after winning her only start to date.